Former MI6 spy Christopher Steele has suddenly backed out of a planned video appearance at a pro-democracy gathering in Baltimore next week for a group founded by Trump-hating chess champ Garry Kasparov, according to Politico. The author of the largely unverified Trump-Russia dossier had been scheduled to discuss disinformation on a panel moderated by Washington Post columnist Anne Applebaum, which is set to include Atlantic Council fellow Evelyn Farkas - a former deputy assistant secretary of defense who notably slipped up on live TV and admitted in March 2017 that the Obama administration had been spying on the Trump campaign. Applebaum said that Steele had gotten "cold feet" last week and canceled on the advice of his legal counsel. As the Daily Caller's Chuck Ross notes, this would have been Steele's first public remarks in the nearly two years since BuzzFeed published his dossier. Perhaps Steele was 'spooked' by testimony last week from former Trump attorney Michael Cohen, who debunked a key claim in the dossier that he traveled to Prague in August 2016 to meet with Kremlin officials in order to arrange clandestine payments to hackers who stole emails from the Clinton campaign and the DNC. Steele's dossier was commissioned by Hillary Clinton's campaign through law firm Perkins Coie, which paid opposition research firm Fusion GPS, which in turn commissioned Steele to assemble the collection of reports which relied heavily on Kremlin officials. The dossier was used by the US intelligence community to obtain a FISA surveillance warrant on Trump campaign aide Carter Page - along with anyone he was in communication with. 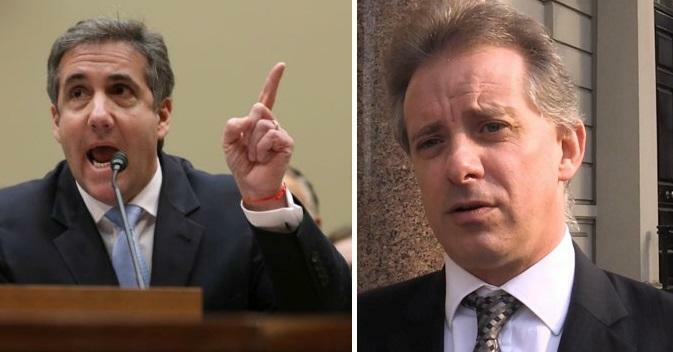 Steele's report claimed that there was a "well-developed conspiracy of co-operation" between the Trump campaign and the Kremlin. The conference Steele backed out of will continue without him - and "will examine and wrestle with the underlying threats to liberal democracy and propose strategies to reinvigorate it," according to promotional materials. Also in attendance will be Sen. Ben Cardin (D-Md. ), former Sen. Heidi Heitkamp (D-N.D.), former Republican House majority leader Eric Cantor (R-Va.) and former undersecretary of defense for George W. Bush Paul Wolfowitz, per Politico. It is being organized by the Renew Democracy Initiative chaired by chess grandmaster Garry Kasparov.